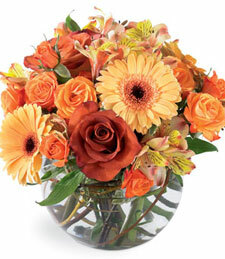 Toast the warm, golden hues of autumn with a glorious greeting of color! Beautifully arranged by a professional florist, this enchanting bowl of orange spray roses and yellow blossoms delights all in its presence. Simply lovely--send today!